The man who spoke those words, our founder Chuck Saylor (pictured above), knows a thing or two about the importance of movement. It was, in part, seeing the effects of stasis in cubicle-bound workplaces that inspired him to move out on his own and start a different kind of furniture company in 2001—one focused on human-centered wellbeing and connection. Thirteen NeoCon shows later for izzy+ (and 40 for Saylor! ), he is once again making a significant move—this time toward retirement—but not without first introducing a new pair of chairs, designed and engineered by Sava Cvek to dramatically shift the way people understand sitting at work. The desire to create Wabi and Nikko, the two chairs being featured in our showroom at NeoCon this year, was sparked by a back injury that radically changed how Saylor felt about sitting down. That’s when Saylor reached out to Cvek to take the design lead and to physical therapist Barbara Hoogenboom to serve as an expert resource on sitting posture and body mechanics. As the team worked through the anatomical research, it became clear that the design of the chair’s seat pan—not its back—was the key to creating a better way to sit. As a result, Cvek designed Wabi and Nikko from the bottom up. The seat pan, by aligning and balancing the pelvis, allows for the greatest freedom of movement while sitting, relieving pressure points and back pain while improving circulation and brain function. Now, as he moves toward retirement at the end of July, the legacy Saylor is leaving through Wabi and Nikko is very fitting for a company that has always been about being innovative, agile, and on the move. 2001: On your mark, get set, go! Chuck Saylor launches izzy, a different kind of furniture company, with human-centered products like Hannah that encourage movement. 2004: Ahead of the movement. We formed a partnership with Norwegian seating expert HAG, who has always understood that ergonomics is about movement. 2006: Research that hits the road. We began visiting colleges and universities to learn as much as we could about the future of teaching and learning spaces. 2008: Moving forward, Better Together. Acquiring Jami Inc. and it’s four brands—Harter, Fixtures Furniture, Zoom Seating, and ABCO—allowed us to move into more markets with more solutions. 2010: 3-2-1…blast-off! Our design team developed a new approach to the design of work and learning spaces, with a focus on movement between three key types of spaces. 2012: On the move to Nicaragua. A group of interior designers takes off with us on our first service-learning adventure in Nicaragua. 2014: BAM! Balanced Active Movement—the key to healthy sitting—is articulated in the creation of Wabi and Nikko, designed by Sava Cvek. And now Chuck Saylor is on the move to his next big adventure. He will be greatly missed, but we will honor his legacy by moving forward in exciting ways, as he has always taught us to do! But Joey Ruiter of Jruiter + Studio, an izzy+ product design partner, says there’s a big difference between working on concepts behind closed doors and getting them out where they can get some air and stir up a response. That’s exactly the process Ruiter and izzy+ founder Chuck Saylor decided to follow when they set out to design the Nemo Bar and Trellis. 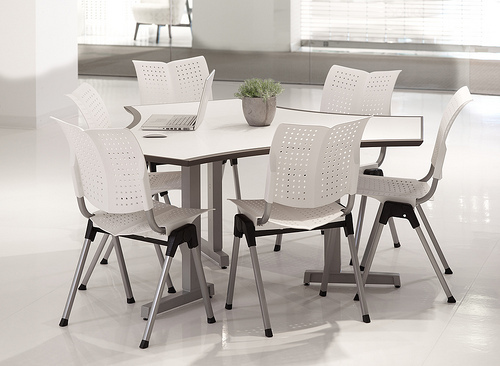 The design team was able to absorb and process two years’ worth of feedback before finalizing the design for production: First, the concept pieces were introduced at NeoCon 2010, then tweaked and brought back for more feedback in 2011. The polished form was presented at NeoCon 2012, where it took a NeoCon Gold Award. Ruiter agrees. Transparency in the design process can feel risky, but true creativity and innovation require going out on some limbs. In the case of the izzy+ Nemo line of concept products, Saylor’s challenge to Ruiter was to imagine and help shape the future of work, at a moment when workers are rapidly becoming more mobile and collaborative than ever. To really get out in front of trends requires a sense of creative freedom as well as engagement in a broader conversation. Ruiter says that’s because people usually only think they know what they want or need. Often there’s a better, more forward-thinking solution out there, if designers are given the freedom to dream and explore. And sometimes, bringing new ideas from concept-to-market means breaking out of existing industry grooves and expectations. It might even mean a clear category doesn’t yet exist for this new thing you’ve made. Clearly they are. The feedback Saylor and Ruiter heard most often about the Nemo Bar and Trellis was along these lines: “We want these—how fast can you produce them?” Well, how about now? izzy+ began taking orders for the Nemo Bar in September 2012, and the Trellis is in development for a fourth quarter launch. In other words, the time to start working and learning in new ways is now. Thanks for being a part of the conversation as we design the future! 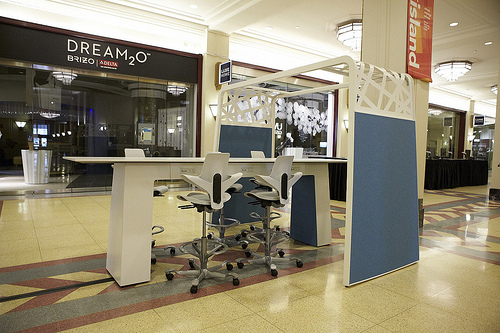 The Nemo Bar & Trellis as a touchdown/charge up station in the Merchandise Mart lobby, NeoCon 2012. 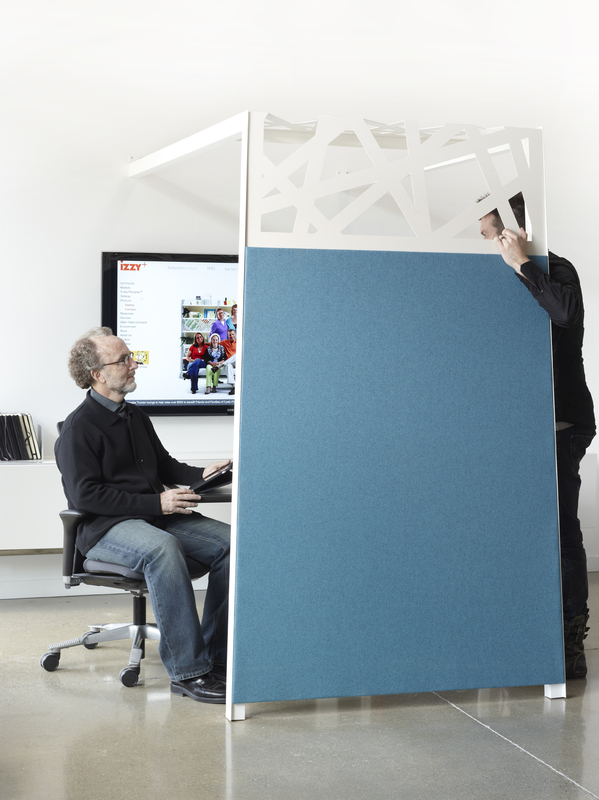 Chuck Saylor and Joey Ruiter chat under the wall-mounted Nemo arbor concept at NeoCon 2011. Quick: Think back to your favorite teachers or professors. What made them so great? A variety of views are represented, but there is a red thread to be teased out: Great teachers seem to be characterized by interaction with their students, not authority over them. That’s exactly what izzy+ founder and CEO Chuck Saylor remembers about his favorite teachers, and it’s exactly why he thinks we need to reconsider the label “teacher” altogether. More and more, the focus is shifting away from the teaching and toward the learning—in other words, away from an idea of a knowledge center or authority. The same sort of shift needs to happen in the workplace, where Saylor has a similar aversion to the word “manager.” Teaching and managing are one-directional, Saylor explains, while learning and growing are multi-directional. 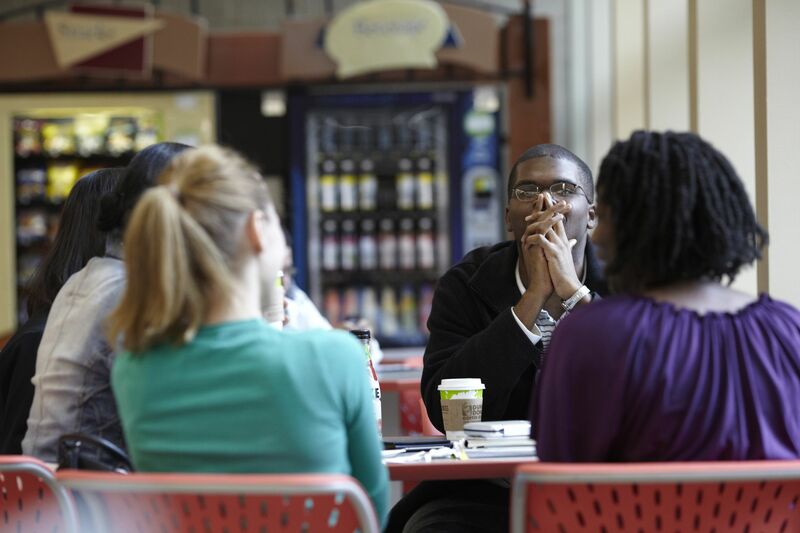 One of the most important places to begin this shift is in the design of spaces for learning, working, and meeting. 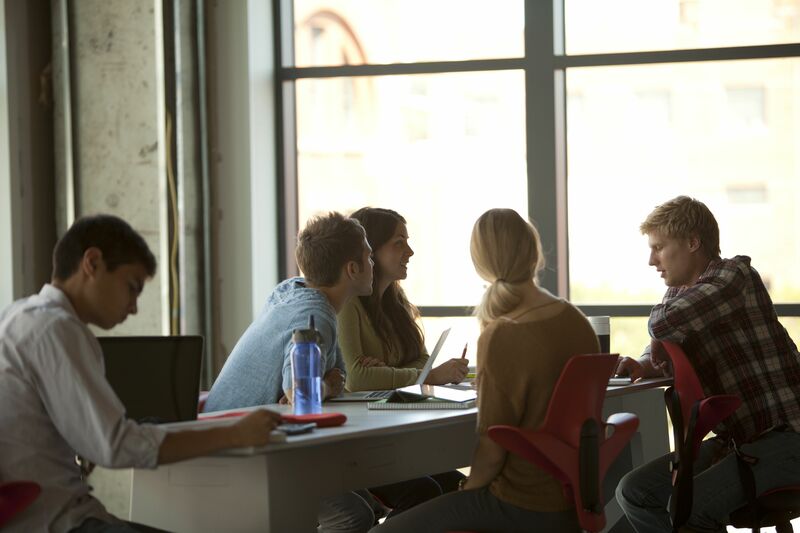 Environments that are set up to allow and even encourage interaction are key to increasing a transparent sharing of ideas and, ultimately, to developing intelligence. For more information around these ideas, Chuck Saylor recommends the book Multipliers: How the Best Leaders Make Everyone Smarter, by Liz Wiseman. The book’s premise is that “multipliers” are leaders who inspire and stretch others, making them smarter and more capable. Being this kind of leader (or teacher), Wiseman says, involves disciplines like optimizing talent, creating intensity, extending challenges, encouraging debate, and instilling ownership. In other words, it involves inspiring and engaging people, not managing them. 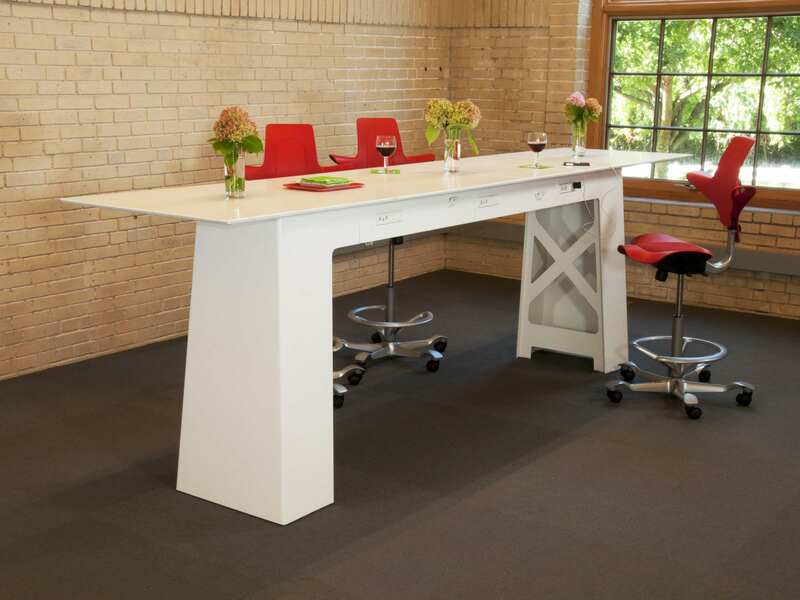 The Dewey 6-Top table by Fixtures (above) prompts interaction and brings people closer together around ideas—in learning settings as well as workplaces. Many of our concept pieces, like the Nemo bar and arbor pictured above, are all about gathering people in casual “third spaces,” whether they’re working independently or having impromptu meetings and conversations. 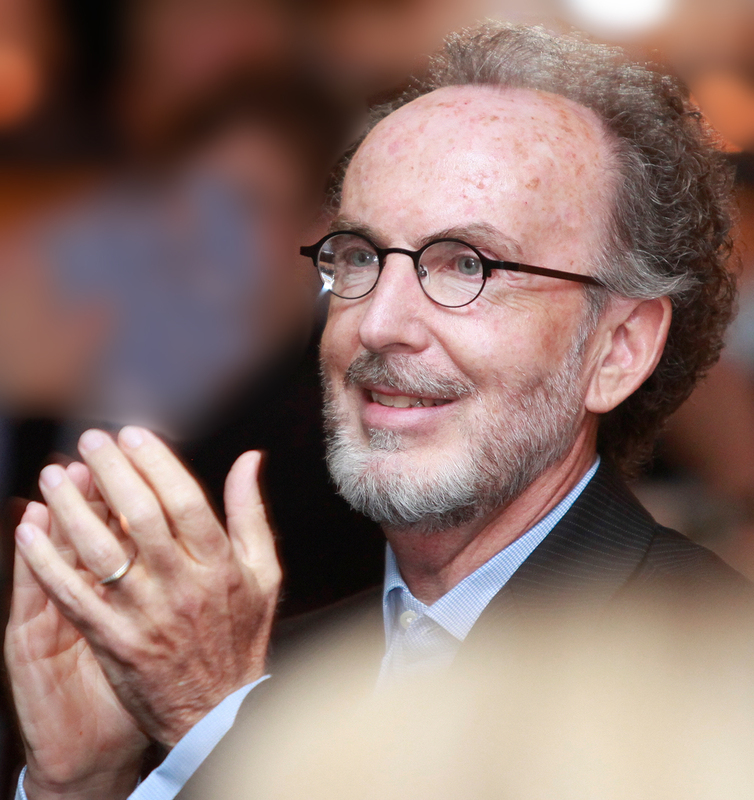 A decade of commitment to anything is a big deal in our culture—for good reason! A tenth birthday takes a child into double-digits—a time of life that begins the transition from little kid to big kid and eventually into the adult they will become. Ten years of marriage is an accomplishment, marking a decade that has no doubt been filled with a mixture of trials, hard work, growth, dreams and joys. And a decade in business—particularly in the midst of a recession and much change—is well worth celebrating. But why, exactly, do we mark these milestones? And how should we mark them, learn from them, and move forward? On the occasion of izzy+’s tenth birthday, our writer, Kristin Tennant, asks izzy+ founder Chuck Saylor about milestones, reflection, celebration and the future. – How does it feel to be 10? It’s a great age to be. When you’re 10, you’re not thinking back on how well you’ve done. You’re just excited about the future—what’s next. That’s definitely how it feels for izzy+. When you’re 10, the future is still wide open, but it’s beginning to be more defined. 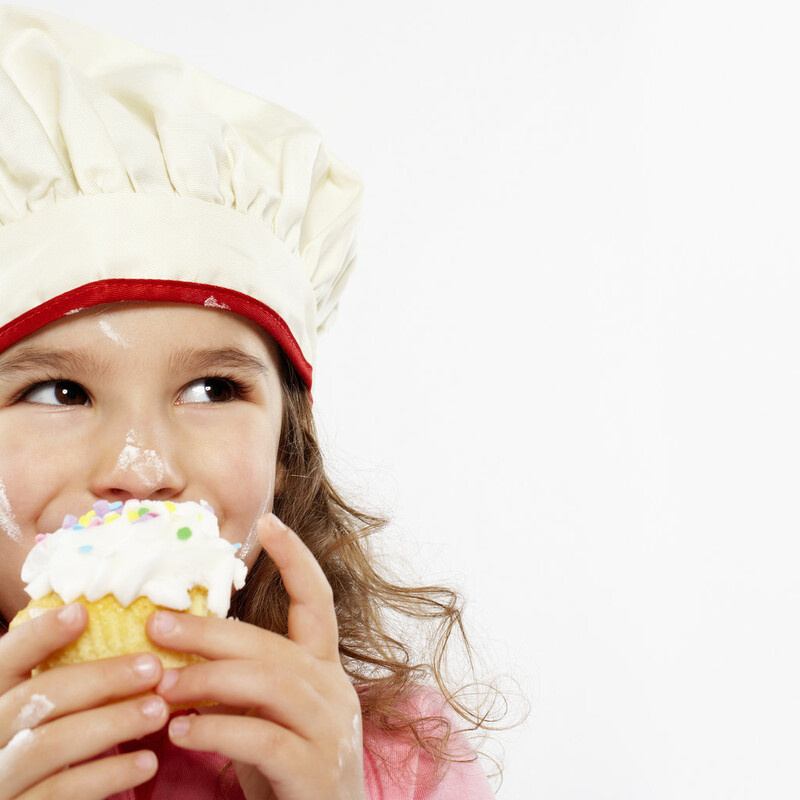 At my granddaughters’ tenth birthdays, I saw the emergence of their personalities—their passions, how they think. I could begin to imagine where they’re going, what path they’re on. – Even though you’re focused on what’s ahead, does reflection still play a part in a milestone like this? Reflection is so important, but I often wonder why we wait for a milestone—a big wedding anniversary or retirement—before we reflect on our lives. If you wait too long to reflect, for fear of not liking what you will see, you end up on the “safe” side of that equation—you don’t learn or grow. We grow when we’re willing to be wrong and take some risks. The more we reflect, the more we become OK with the possibility of being wrong. It allows us to learn more, grow and pass it along to others. – You mentioned passing along what we’ve learned to others. Is that izzy+’s “Better Together” mantra in action? Yes! That’s the good thing about gathering together to celebrate something—it’s so much more meaningful to reflect with others. Going off into the woods to reflect on my own turns that active verb into more of a noun. There’s a lack of dialogue and conversation. 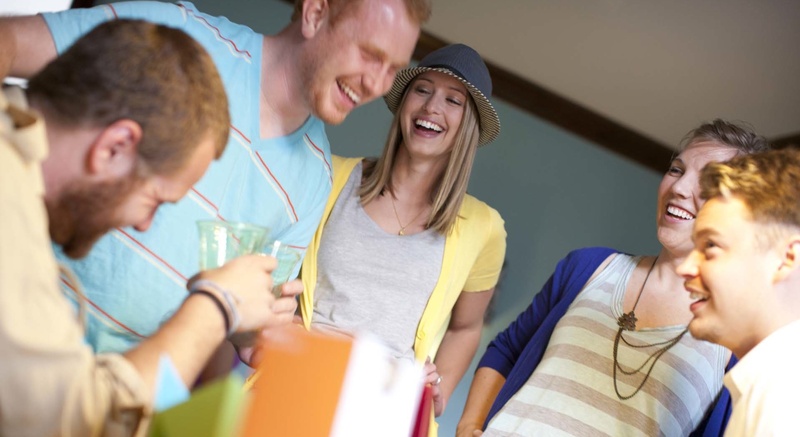 We miss out on those opportunities to share what we’ve learned and make everyone better. For me, it’s reflecting and learning together that helps create a path for the future—a better understanding and vision for going forward. – So ultimately, this 10th birthday is more about what’s ahead than what’s already happened. Exactly. I don’t look back and how small we were and think about how much bigger we are now—that’s so immaterial. I look out over the organization and see a group that’s growing, contributing, taking risks, being open, constructive, kind and creative. 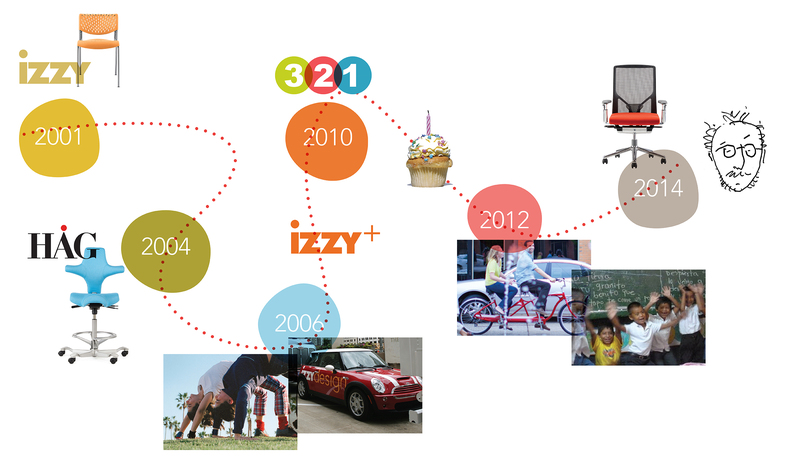 The people at izzy+ are a reflection of where we’ve been, who we are, and where we’re going. And the hopes I have for izzy+ are very connected to the hopes I have for my family and all the people I love: I hope izzy+ continues to grow and create a place where people can be transparent, follow their dreams, add value, and make a difference in their lives and the lives of others. When you look back, there will always be negatives, but I always err on the side of positive. I like to focus on what’s inspiring, meaningful and adds value, and then figure out how to communicate those things, so everyone can be inspired moving forward.